I love to shop at Trader Joe’s! Their produce is always fresh, they have great weekly specials and have a really unique, well priced wine and liquor department without having to fight with a giant grocery store atmosphere. While browsing the aisles today I was inspired to create something quick and healthy for dinner tonight and didn’t want to ruin the workout I had just suffered through by making something that would make me feel bloated and bad about myself. There were so many bright orange pumpkins displayed around the store that I thought something based on the same fall flavor would be great. A few more minutes in the produce department and I came up with an idea that didn’t seem very hard at all. Cook the butternut squash, in it’s package with a corner cut off, in the microwave for 6 minutes. Shred the mozzarella cheese and grate 1/4 to 1/3 of the wedge of the gouda-parmesan wedge into two separate bowls and set aside. In Food Processor (I used my Vitamix) combine the squash, milk, garlic, nutmeg, salt and 1/2 the container of ricotta cheese. Process until just smooth. Do not over process. If too thick add a little more milk. Taste and adjust the spices then set aside. In a medium mixing bowl combine the spinach, the other half container of ricotta cheese, 1/2 of the mozzarella cheese, the chopped garlic, and some salt and pepper. Stir until the spinach is well coated. Top the lasagna with the rest of the mozzarella cheese, the grated parmesan-gouda cheese, and then sprinkle with oregano, paprika and the chopped fresh basil. Bake in a 375 degree oven for 45 minutes, or until the top is just browned. Remove from the oven and let stand 5-10 minutes so the cheese sets. Cut into 8 pieces and serve with a green salad for a healthy meal. My husband also added some Frank’s Red Hot to spice his up. It was a great change of pace and there was enough left over for a couple of lunches this week! 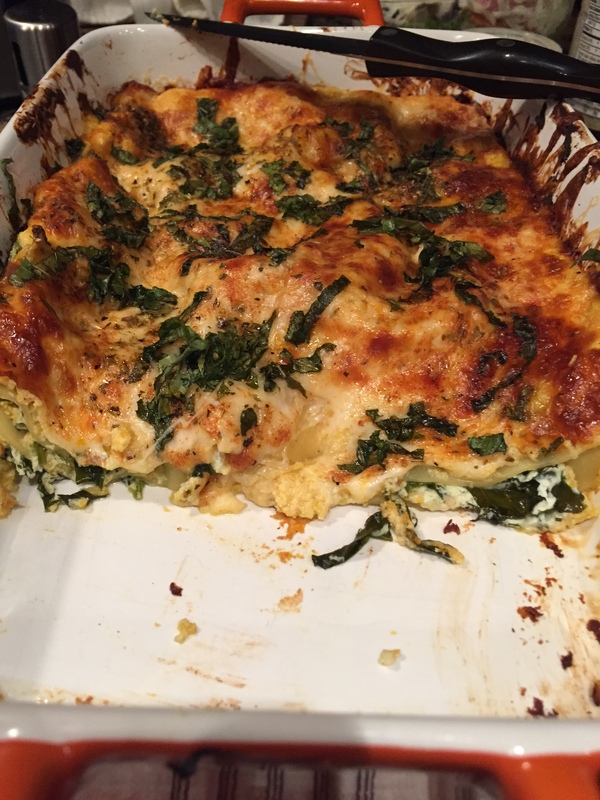 Posted on October 6, 2015 October 6, 2015 by ls1228Posted in Dinner, Meatless Monday, RecipesTagged butternut squash, Frank's Red Hot, healthy meal, lasagna, leftovers, meatless monday, pumpkins, spinach, Trader Joe's, Vitamix.